The changeable weather of last week really emphasised the need for fishers to vary their tactics if they were to maintain consistency in their catch rates and anglers who had the ability to fish Buzzers, Nymphs and Floating Flies did the best. There were many instances during the week when there was a terrific rise of fish which would then switch off and no matter what surface fly you tried, you could not entice them to it. An example of this was James West who changed his tactics throughout his session and landed 20 fish on the WSW and 6 on the Dry Fly. 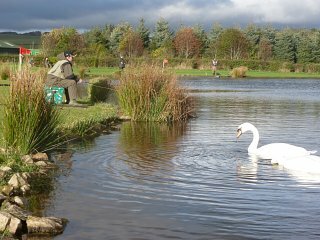 Likewise Steve Prince had 14 fish for his day changing from Dries to Diawl Bachs and Paul Wilson from Aberdeen enjoyed his first ever visit to Lochter netting 11 fish on Hare’s Ears and Small Black Dry’s. Buzzers continued to do consistently well in most conditions and expert exponents of this were Paul Begg from Aberdeen with 11 fish and veteran Kintore angler, Brian Ross, on a break from catching some fine brownies on the River Don of late, had 10 fish on Small Black Buzzers. Davy Wood from Aberdeen on his return from a fishing break to the South of Scotland with his two mates Walter Senior and Jim McGuire had a great day netting 36 fish on one of Walters home tied WSW’s. Other flies used during the week were the Foam Daddy, with Simon Ruddiman landing 9 fish on this delicately skilful method and on a evening session Robbie Taylor from Turriff had 8 fish to the net using very small white caenis fly’s. The Blobby boys – Dougie & Billy split their day between Blobs & Buzzers to good effect with 22 caught between them. With high pressure building during the week it should ensure that there is some good seasonal top of the water sport to be had.